Concussions in college football: How should NCAA rules change to protect players like University of Michigan’s Shane Morris? How should the NCAA be protecting concussed student-athletes? 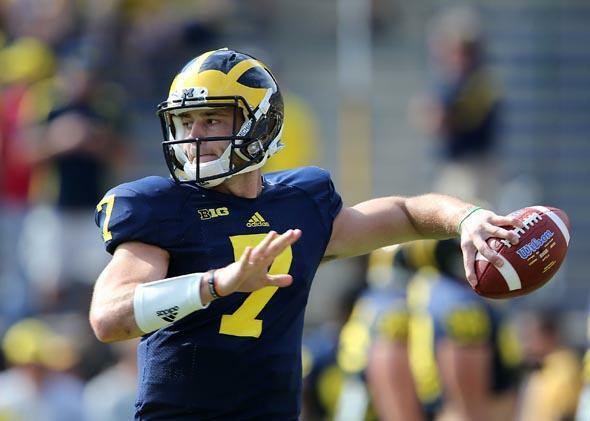 Michigan quarterback Shane Morris warms up before the game against Minnesota on Sept. 27, 2014, in Ann Arbor, Michigan. When the University of Michigan let quarterback Shane Morris stay in a game last Saturday despite his exhibiting symptoms of what would eventually prove to be a concussion, it didn’t just create a major controversy for itself. It also renewed a debate for the National Collegiate Athletic Association and all of college football over whether the association should try to regulate the handling of brain injuries or merely recommend best practices. In July, the NCAA released new guidelines regarding concussions and other athletic brain injuries, and some criticized the association for drafting a list of suggestions rather than hard regulations that would have to be followed by member institutions. The NCAA defended the decision, saying that releasing nonbinding guidelines would allow member institutions to better address concussions while avoiding the lengthy legislative process. Hainline and the NCAA would repeat the assertion later, when a lawsuit ended with a $70 million settlement but no new regulations, and again in September, when Hainline delivered a well-received presentation on athlete health to the Knight Commission on Intercollegiate Athletics. Guidelines may “lack the teeth of regulations,” he said at the time, but they are the quickest way to establish a cultural norm among member institutions. Now, some head trauma researchers and sports law experts question whether that norm is being established quickly enough. Despite visible symptoms of a concussion and of an earlier leg injury, Morris was reinserted into Michigan’s game Saturday before being evaluated. Such an action is contrary to Michigan’s protocols and all medical recommendations designed to protect athletes’ health, including those of the NCAA and the Big Ten Conference. None of those protocols carry sanctions if they are not followed. Hainline has said that the guidelines could one day become regulations, but the NCAA has not indicated when that might happen. (The association did not respond to requests for comment Wednesday.) The sanctions and rules wouldn’t have to come from the NCAA, however, Koller said. Lawmakers, regional conferences, and even a team’s fan base could hold an athletic department or coaching staff accountable, she said, pointing to ongoing protests at the University of Michigan. Since Saturday, students have marched on campus, demanding that Michigan’s football coach, Brady Hoke, and athletic director, Dave Brandon, be fired. Other experts on concussions and brain trauma said they are unsure whether regulations would help any more than guidelines. “There’s a lot of things in society we simply need to do without people giving us rules to follow,” said Dennis Molfese, director of the Developmental Brain Laboratory at the University of Nebraska–Lincoln. He called instead for more vigilance on the part of team physicians watching what happens on the field. Sanctions would not give a coaching staff the ability to notice every concussive injury as it happens, Molfese said. Lewis Margolis, an injury control researcher and an associate professor of child health at the University of North Carolina at Chapel Hill, said there’s too much “conflict of interest” among coaching staff members, team physicians, and the NCAA to ever trust that an athlete’s health will be prioritized, even with the threat of sanctions. Margolis frequently compares the NCAA’s handling of concussions to the Tuskegee syphilis experiment. In that study—now decried as deceptive and unethical—the U.S. Public Health Service studied the progression of untreated syphilis on black men, tricking them into thinking they were receiving treatment for the disease. While Koller said she believes sanctions are better than guidelines, she too has concerns.